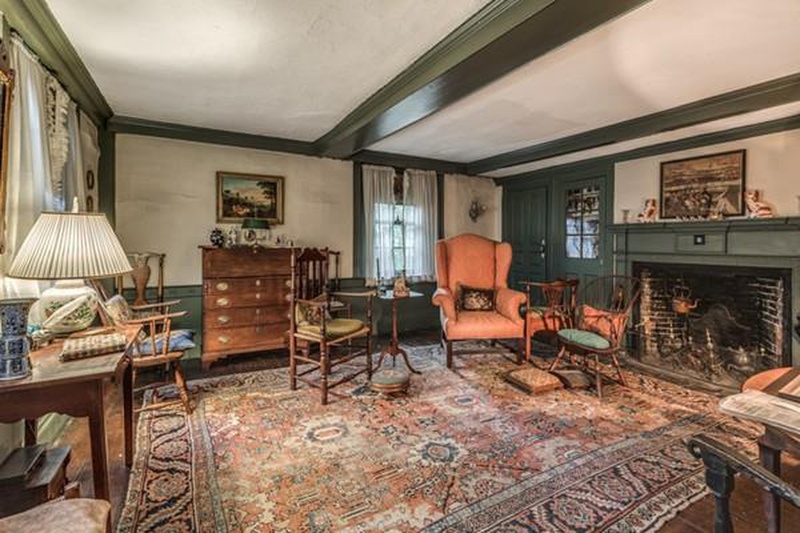 Kaminski Auctions is pleased to present the contents of the historic Stephen Daniels House, one of the oldest houses of Salem, Massachusetts in our March 30th and 31st auction. On offer is a vast selection of early American furniture and furnishings, including samplers, redware, brass, and nautical items, Staffordshire figures, silhouettes and, carved decoys. 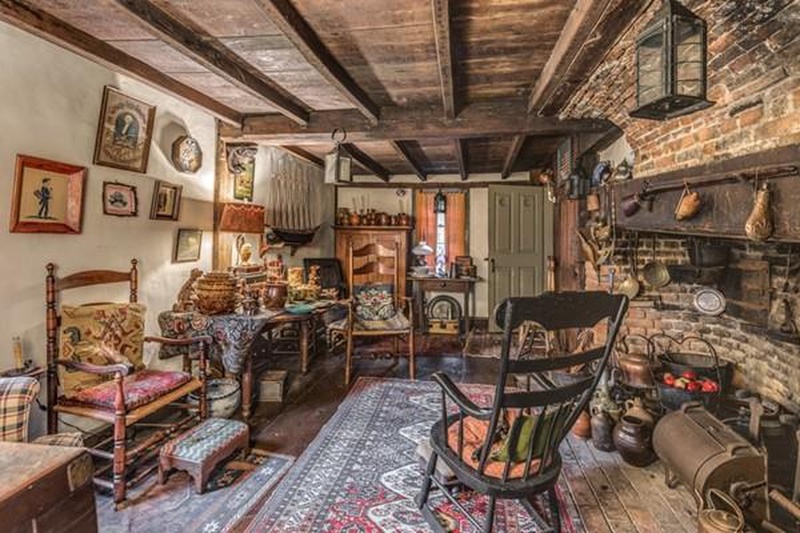 "The 1667 Stephen Daniels House and collection is truly a time capsule of 17th and 18th-century life during the colonial era in Salem, Massachusetts." 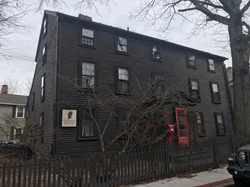 Kaminski Auctions is pleased to present the contents of the historic Stephen Daniels House, one of the oldest houses of Salem Massachusetts in our March 30 and 31 auction. Stephen Daniel's, a skilled shipwright built this fine colonial house in 1667. In 1756, the house was added on to by his great-grandson Samuel Silsbee, a carpenter of the time. 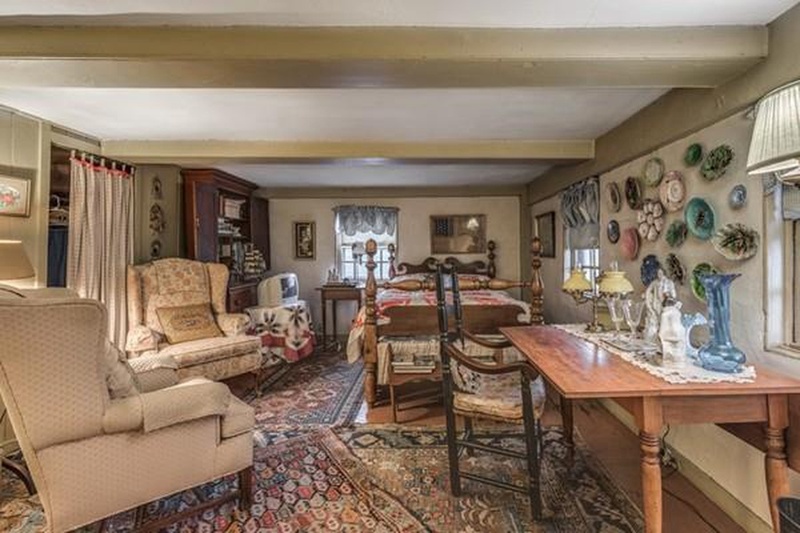 A time capsule of the 17th and 18th centuries, the Stephen Daniels house most recently was a celebrated bed and breakfast run by the late Catherine "Kay" B. Gill for over 55 years. Having served as a docent at the Peabody Essex Museum, Mrs. Gill was well-informed on Salem history and loved to share her knowledge with her many guests. She spent a lifetime traveling and collecting antiques of the period to decorate her home. Contents of the Stephen Daniels will excite early American and primitive collectors alike. On offer is a vast selection of early American furniture and furnishings, including samplers, redware, brass, and nautical items, Staffordshire figures, silhouettes and, carved decoys. Furniture highlights include an early New England pine settle bench, a New England split banister back armchair, an Early American arrow-back long bench, an antique New England two door pie safe and an antique New England table with breadboard ends and grain decoration. From Essex County comes an early wainscot chair property of Stephen Daniels, and an 18th century Queen Anne tiger maple drop-leaf table that graced the Stephens living room. Collectors of George Washington artifacts will not want to miss a circa 1800 George Washington memorial of Mount Vernon valued at $4,000-$8,000. It is the top valued lot of the Daniels sale. An early 20th-century antique ship model of the American 7-masted schooner, the ‘Thomas W. Lawson,' with full rigging measures 37" H x 63" L x 8" D is estimated to bring $2,000-$4,000. An oil painting of this seaworthy ship was offered at Skinner's for $8,000-$12,000. Smalls abound in the collection, including several groups of Early English Staffordshire, a large group of copper items, to include: a sizeable dovetailed milk pitcher, molds, tankards, and a large Turk head mold. There are several lots of early redware, including decorated plates, bowls, and jugs, and a group of ten Rockingham/Bennington mixing bowls in assorted sizes valued at $300-$500. Early 19th century samplers from Sarah Carter, with poem, florals, and two 19th-century samplers by Sarah Walton, with one dated 1859, will cross the block as well, several early portraits that had been hanging for decades in the Stephen Daniels house. The most charming is an old portrait of a sea captain with a white collar valued at $700-$1,200, and an early Folk art portrait of a young girl with a rose. A 19th century carved wooden eagle measuring 11 inches across, circa 1930, a Merganser decoy from the South Shore of Massachusetts, and several other duck decoys round out the highlights of the Stephen Daniels collection. Day two of the auction on Sunday, March 31st features our monthly estate offerings which include a selection of refined Continental paintings and portraits. A 19th-century Italian school painting of Putti with fruit, measuring 43 inches x 62 inches is the feature lot of the day and is expected to bring between $15,000-$20,000. Another important Continental painting is attributed to Jean-Baptiste-Simeon Chardin (1699-1779), known for his portraits and still lifes. This genre painting depicts a young woman seated with a letter. The oil on canvas is unsigned but expected to bring between $12,000-$18,000. Also, in the line-up is a portrait of a young boy, titled "Un Petit Garcon," oil on canvas, attributed to the French genre, and portrait artist, Jean-Baptiste Greuze (1725-1805.) This finely detailed portrait has numerous labels verso and is expected to bring. $8,000-$12,000. There are three other entries by Greuze, as well. All three, are beautifully painted sentimental portraits which include, a boy with a book, a portrait study of a young boy with a ruffled collar, and another of a young woman gazing upwards. American art in the auction includes three paintings by the artist/illustrator Elihu Vedder (1836-1923). Known as a Romantic or Symbolist painter, Vedder based his paintings on fantasies and dreams he had. ‘At the Well," by Vedder, is an oil on canvas laid to board, signed with his monogram, and dated 1867. Another pastel on paper features a rocky landscape signed with the artist's cipher, and Kennedy Galleries, New York label verso. The third is a drawing in pastel on paper of a seated girl that was exhibited at the Hofstra Museum, New York in 1989 also from the Kennedy Galleries, New York. With an unusually large selection of portraits, the auction continues with an 18th-century portrait, circa 1780, of a young girl with a dog, most likely painted by Ralph Earl (1751-1801) while the artist was studying in England. Other notable paintings include a watercolor and gouache on paper by James Bard (1815-1897), of the paddle boat titled ‘Side-Wheeler Jesse Hoyt on the Hudson,’ a landscape painting of a lighthouse attributed to Albert Pinkham Ryder (1847-1917), and an evening landscape by George Nelson Cass (1831-1882), in its’ original period frame. There are several marble sculptures from Italy including one of Venus, and another of Caesa, and a noteworthy bronze of the Death Mask of Modigliani cast of the original, created by Moise Kisling and Jacques Lipchitz. This particular bronze was cast by their friend and fellow artist, James Rosenburg. Rosenburg had seven casts made by the Roman Bronze Works. The example in the sale is stamped #1, and "R B W, and stands 9 inches high. As always, there is an excellent selection of antique carpets, including a Persian Keshan, circa 1900, an antique Persian Sarouk rug, Hamadans, Kermans, and a Turkish Oushak. Sterling silver flatware sets from Reed and Barton in the ‘Francis I' pattern, Gorham, Lilly of the Valley and a set of 'Fine Arts' in the 'Tranquility' pattern are the silver highlights of the second day, and a vintage 1960's, 18 carat, diamond leaf necklace, approximately 17 inches long, with 35 grams troy weight is the jewelry highlight of the auction. The auction is Saturday, and Sunday, March 30th and 31st auction starting at 10:00 AM EST at the Kaminski Auctions gallery, RT. 62, Beverly, Massachusetts. Preview times are Monday – Friday, March 25-29, 10:00 AM – 5:00 PM, and days of the sale starting at 8:00 AM. Preview is open while the auction is live. For more information go to http://www.kaminskiauctions.com and sign up to bid with KaminskiLIVE. 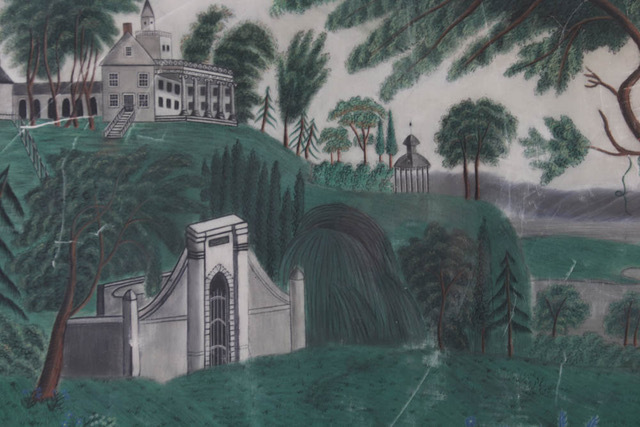 George Washington Memorial of Mount Vernon, original sandpaper drawing, circa 1800.